A wonderful combination of Huckleberries and Red Raspberries. A truly delicious flavor! 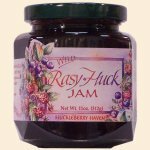 Delicious blend of Wild Huckleberries & Red Raspberries! Sure to become a family favorite. Ingredients: Wild Huckleberries, Red Raspberries, Sugar, Pectin, Corn Syrup Solids, Citric Acid.